El Picacho del Diablo (3,096 m / 10,157 ft) is the highest point in the Mexican state of Baja California and on the Baja Peninsula. 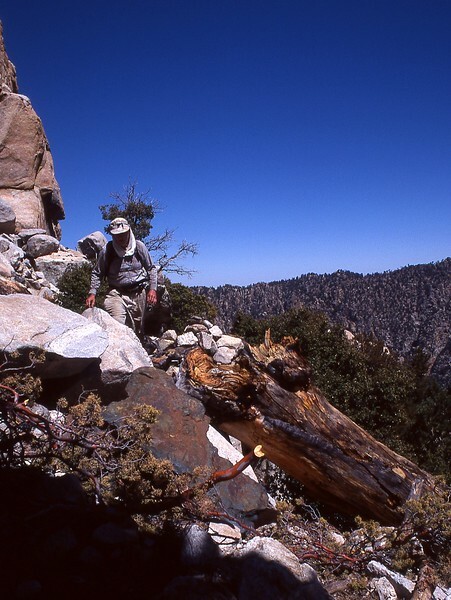 The first recorded ascent was in 1911 by cartographer Don McClain. 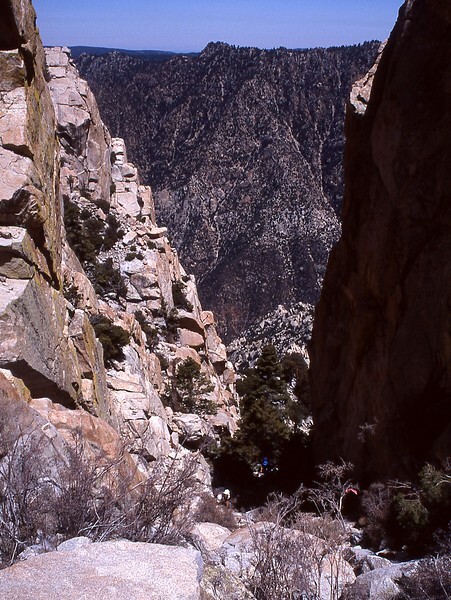 In 1932, a party led by Norman Clyde (of Sierra Nevada fame) made the second ascent (as recounted in his book El Picacho del Diablo: The Conquest of Lower California’s Highest Peak (Dawson, 1975)). 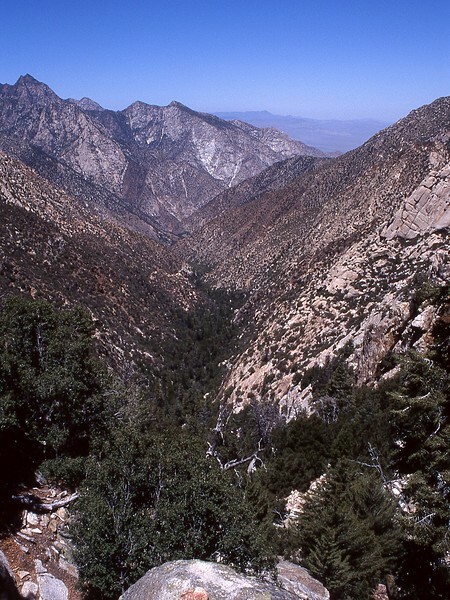 This peak (also called Cerro de la Encantada) is considered by many to be the toughest climb on the Sierra Club’s Desert Peak Section list. 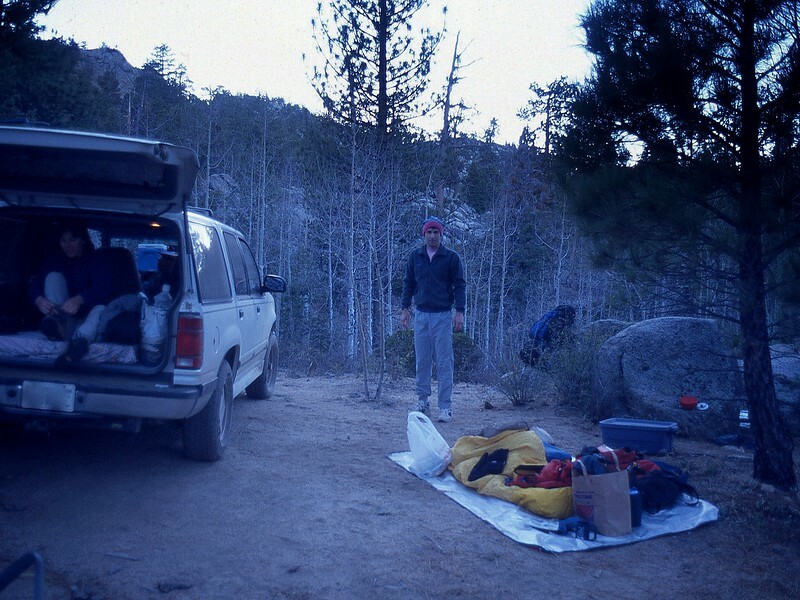 It was this listing that brought my friends John and Donna, myself, and five other desert peak enthusiasts to the Los Llanitos Trailhead in Parque Nacional Sierra de San Pedro Mártir after a 10 hour drive from Southern California (with only one flat tire). The next day, we backpacked to Blue Bottle Saddle, a few of us summited Cerro Botella Azul, and then we made the 3,000 foot descent into Canyon del Diablo. There was a faint use trail and some cairns to follow but intense route finding was needed to avoid being cut-off by dry waterfalls. Late afternoon found us at Campo Noche, where there were several good tent sites and a reliable water source. The next morning we made the 3,000+ foot ascent up Night Wash, Slot Wash, and the steeply-inclined granite slabs in Wall Street to the main summit ridge and followed that to the summit. 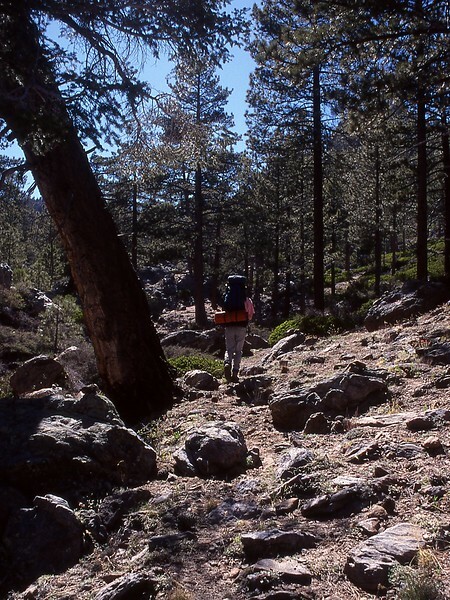 There was no formal trail up these washes and slabs – just some use scuffs and a few cairns – so, once again, intense route finding was called for. We spent about 30 minutes on top enjoying the views – we could see the Gulf of California to the east and the route we had taken over the last two days to get here. 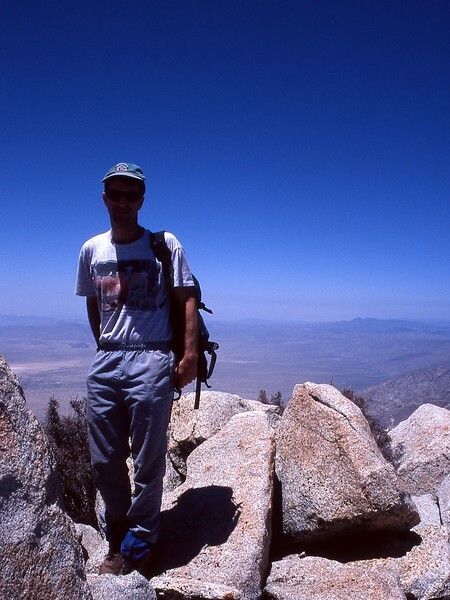 Around us was some of the most rugged and remote desert terrain any of us had ever seen. 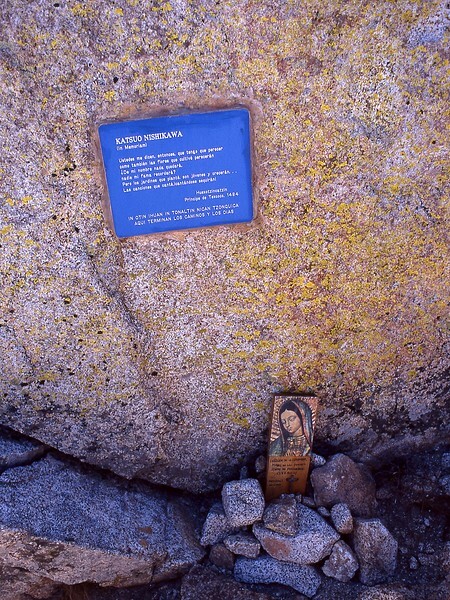 There’s a memorial plaque (placed in 1988) on the summit for Katsuo Nishikawa, who was a Universidad Nacional Autónoma de México (UNAM) student who participated in climbs of this peak. The reason for his loss was not explained. The climb down was uneventful and we were back at Campo Noche by late afternoon. 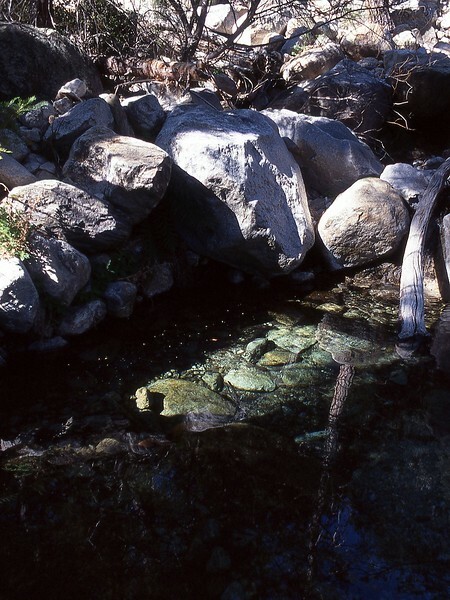 A cool splash in the pools near the camp was much appreciated. We started at dawn the next day to make the 3,000 foot climb out of the canyon before it got too hot. 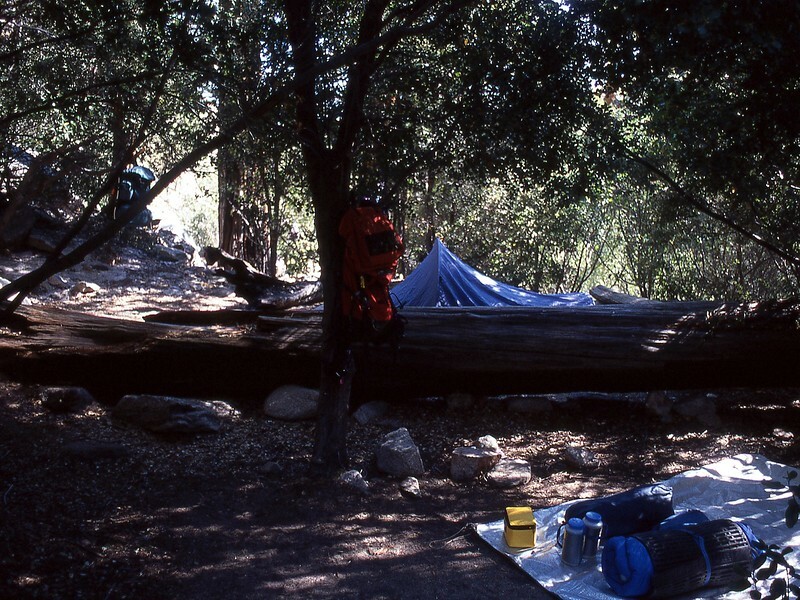 We were at the trailhead by noon, and, after stopping at the ranger station to buy t-shirts, back in Southern California before midnight. After 17 miles of hiking and 10,300 feet of elevation gain and 20 hours of driving, all in just 3 days, we were willing to give El Picacho del Diablo credit as both a great, challenging climb and the toughest peak on the DPS list! For a different take on this peak, see Eleanor Dart O’Bryon’s Coming Home from Devil Mountain (Harbinger House, 1989).